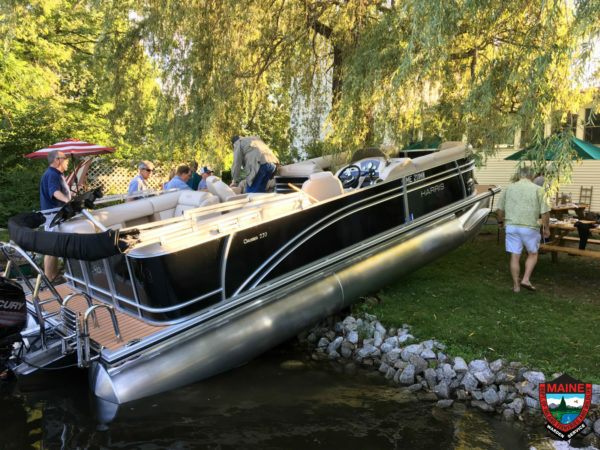 A pontoon boat crash behind a restaurant on Great Pond in Belgrade left four people with minor injuries, according to the Maine Warden Service. Four people suffered minor injuries Wednesday evening when an out-of-control pontoon boat crashed onto the shores of Great Pond in Belgrade and then into two tables at which people were dining behind a local restaurant, according to state game wardens. One of the injured people was a passenger on the pontoon boat and the three others were seated at tables onshore. The crash happened shortly before 6 p.m. behind the Village Inn Restaurant, which is located at the outlet of Great Pond, said Cpl. John MacDonald of the Maine Warden Service. The boat is owned by James Julia, 71, of South China, a well-known Maine auctioneer whose Fairfield-based auction house specializes in rare firearms, fine art and other high-end antique sales. His assistant said Thursday that Julia had a sore arm from the crash but was otherwise unscathed. Julia had jumped off to tie up his new 22-foot Harris brand pontoon boat powered by a 115 horsepower motor when he realized he had left the boat in reverse. Julia asked a passenger, Joseph Larue, 76, of Knoxville, Tennessee to shut the boat off, MacDonald said. But Larue was inexperienced with boating and accidentally pushed the throttle forward, causing the boat to accelerate forward, he said. The boat then accelerated quickly, throwing Larue and two other passengers backward as the pontoon boat ran up on shore. 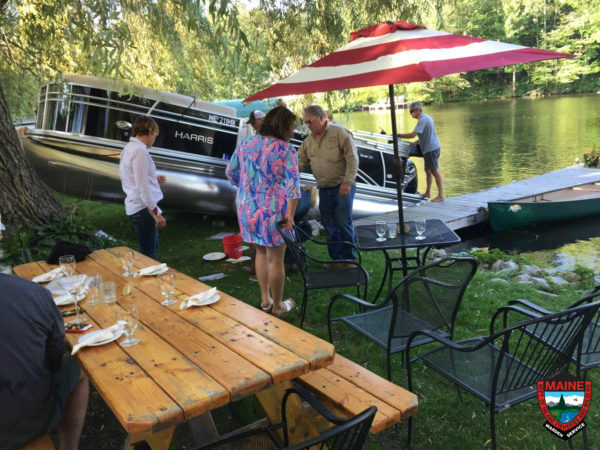 As the pontoon boat climbed the shoreline, it struck a small dinner table as well as a picnic table at which a total of eight people were dining at the time, MacDonald said. All four refused medical treatment, he said.